Oh, OK, I think I’ve kept you in suspense long enough. Here’s the recipe I promised I would share that goes very well with the Lemon Yogurt Cake. Don’t have any Lemon Yogurt Cake? Don’t worry, this fruit salad is quite tasty all on it’s own! You’ll want to start off with 1 tablespoon of Limoncello and taste before adding more. While it’s delicious, it’s also quite strong! Don’t have (or want to use) any Limoncello? Honey would be a fine, albeit sweeter, substitute. Oh, and whatever you do, don’t skip the mint! You won’t believe how a little bit of fresh mint can take fruit to a whole other level. Place all the ingredients in a medium bowl and toss to combine. 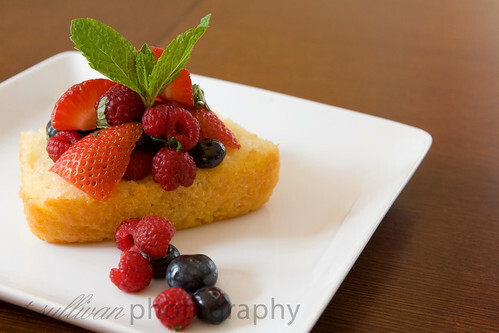 Serve plain, with yogurt, or with a thick slice of Low-Fat Lemon Yogurt Cake for a healthy and refreshing dessert. Just “discovered” your blog today and everything is so gorgeous!! !